The April edition of LDC’s Dynamic Location Intelligence Bulletin (full version is available to all customers of LDC only) looks at retail location activity levels for March, including data on net changes in store numbers, vacancy rates and market activity highlights across retail locations in GB. Shop numbers grew for the sixth month in a row as openings increased faster than closures once more. This positive trend promises to start to recover some of the loss seen in the mid-year slump of 2016. On a less positive note, Comparison Retail fell back into decline, after a brief peak above 0 in February, but all other categories (Convenience, Leisure and Service) grew in stock. Numbers of stores in Town Centres continued their recent growth spurt by welcoming a net 218 shops in March, whilst Shopping Centres and Retail Parks continued on their more moderate, but steady, upwards trajectory. It is worth noting that although in terms of numbers, growth in Retail Parks looks fairly insignificant at +45 units across the UK, however, the sheer size of the units that typically sit on Retail Parks (often 13 times as large as units that sit in Town Centres) make for a significant increase in retail floor space. 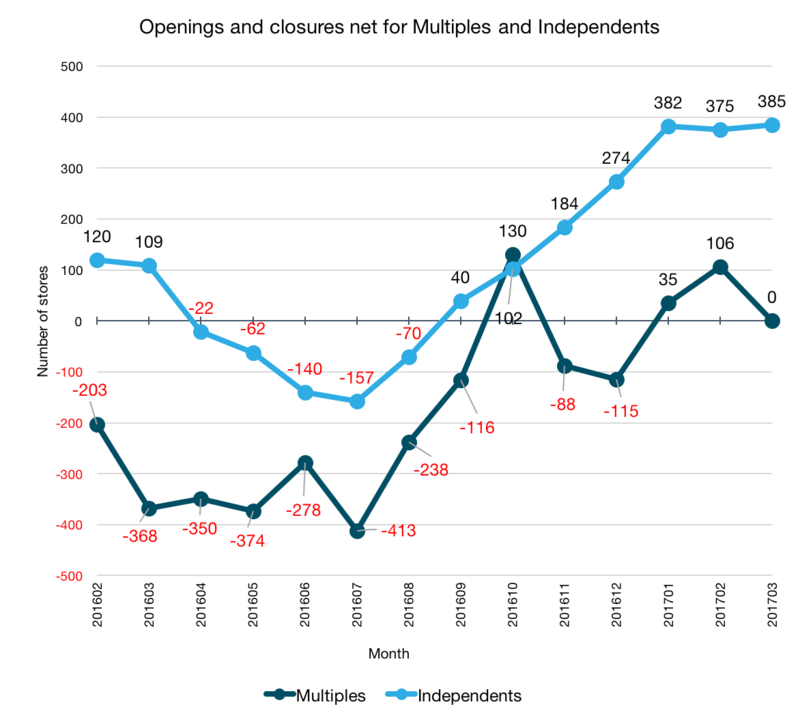 Independent businesses continued to grow, increasing by 385 in March, adding onto a seven month period of growth for Independents. The growth rate has not been as consistent for Multiples however, and after two months of growth, they dipped back down to 0. More good news for vacancy rates, as the Retail Vacancy rate dipped again to 12.0%, which is the lowest we have seen since the historic high of 14.6% back in 2012. The Leisure Vacancy rate remained at 8.0% for another month, and the change in the Retail rate was not enough to bring the combined vacancy rate (All Vacancy) down with it. Market highlights from the bulletin included Aldi opening it's 700th store in Whitstable, Kent, the re-branding of Leisure brand Giraffe to Giraffe World Kitchen, exciting plans to transform Cardiff's Capitol Shopping Centre into a mixed retail and leisure scheme and expansion of Westfield Stratford City. For more information about the Dynamic Location Intelligence Bulletin or its contents, please contact marketing@localdatacompany.com. For similar data on Retail and Leisure activity for the full year 2016, download a free summary of our latest report here.